Villa Rica #2 is a lovely 6 sleeper self catering holiday unit in a secure complex in Port Edward. The unit is just a short drive to the main swimming beach and is close to the Wild Coast Sun with its casino and water park. The unit has 2 bedrooms which can sleep 6 guests. Both bedrooms have queen sized beds and there are 2 single beds in the enclosed veranda. The main bedroom also boasts an airconditioner for those hot summer days. There is a flat screen TV in the lounge which can also accept USB's. There is an OpenView decoder with +-18 free channels, however you are welcome to bring your own DSTV decoder. We do have a connection for the Explora decoders as well. 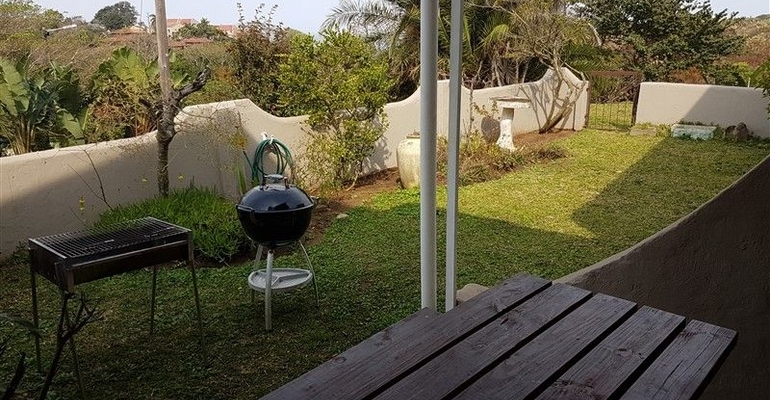 There is a veranda with small garden at the front of the unit and there is a portable braai and a kettle braai for your use. The unit has been recently renovated and is well equipped for a self catering holiday. There are 2 bathrooms, one of which has a shower.